1) make (something) appear larger than it is, especially with a lens or microscope; increase or exaggerate the importance of. Synonyms: enlarge - boost - enhance - maximize - increase - augment - extend - expand - amplify - intensify; informal - blow up. 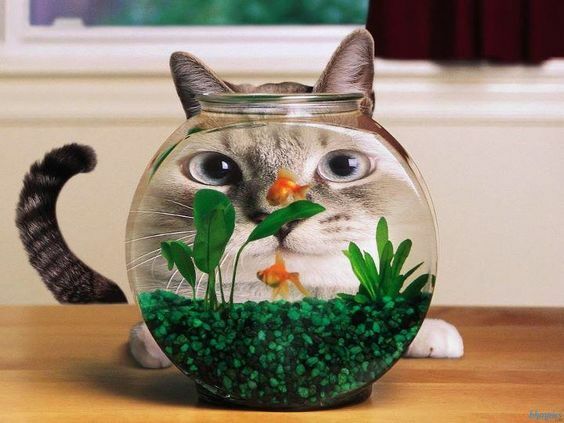 This fun picture is possible because the fishbowl acts to magnify the face of the cat. It works the same way that a lens or magnifying glass works because of the curved surface of the bowl and because the light travels through water and glass differently to the way they pass through air. If you'd like to find out a little more about the science behind why this happens you could take a look HERE.